Tonight is the 91st Academy Awards ceremony. As I have stated before, as a movie nerd, the Oscars are like my Superbowl. 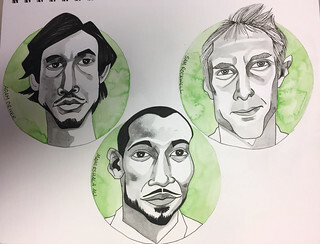 For the past couple of years, I have illustrated the nominees in the acting categories in my Art Journal. 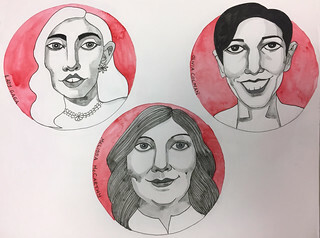 I usually don’t attempt to draw real life people so it serves as a useful annual reminder that I am absolutely, most definitely, not a portraitist. Capturing people’s likenesses apparently eludes me. Still, it’s a fun exercise and a good way to record the evening’s entertainment in my journal. In 2017, I did a sort of blind contour mugshots sort of thing. That was fun but you really would not have been able to identify any of the people I had drawn. 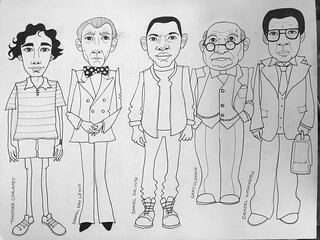 Last year, I decided to draw each actor in full figure and in character. This was a regretful decision. This year, therefore, I went back to just heads and revisited the kind-of-mugshot idea but without using blind contour as my starting point. 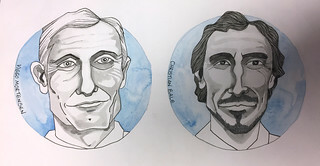 This resulted in better quality drawings but definitely not much in the way of improvement when it comes to likenesses. A few of these people are ones I have drawn before and yet I still cannot get their faces right. Just as well I prefer drawing faces from my imagination instead then! Apologies, incidentally, for the awful shadows on these photos. Aside from the gloomy winter light, I have no access right now to the spot where I usually photograph my artwork. I don’t have a dog in this fight since I have seen literally zero of the movies for which these performances have been recognised. While we go as a family to the cinema to see the odd blockbuster or animated movie, Mr Pict and I have to wait for movies to appear on the small screen before we can view them. 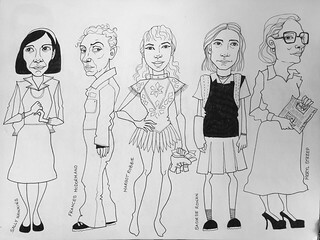 I have no punditry to offer, therefore, and no predictions to make except that I guarantee all these people will look so much better – and more human – on the night than they appear in my drawings. These are the best actress nominees. These are the best actor nominees. These are the best supporting actress nominees. These are the best supporting actor nominees. 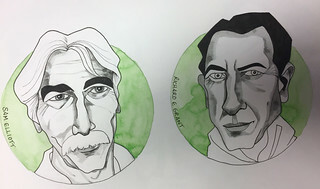 When it comes to subjects for my art, I am always drawn to faces and figures or monsters or anthropomorphised animals. What I really don’t tend to touch upon is botanicals, still life, or landscapes. I decided, therefore, to challenge myself to produce a landscape in the orange section of my Rainbow Art Journal. Having grown up in Fife, I thought of the orange pantiles that adorn the roofs in villages like Culross – a result of the tiles initially being imported as ballast. 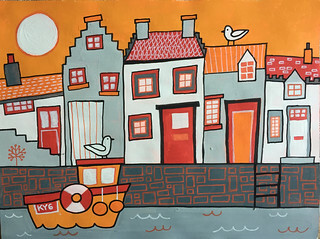 I grew up in the post-war new town of Glenrothes but always enjoyed visiting the fishing villages of the East Neuk so I decided to illustrate a harbour village in my art journal. There is zero verisimilitude in my illustration and I didn’t use any photo references so my buildings are all a fusion of memory and imagination. Landscape is definitely not my thing but I really enjoyed creating this page. I don’t even care that the scale is bonkers, including monstrous seagulls. Maybe I will force myself to do landscapes more frequently. I have always loved words. As a kid, I loved to just flip the dictionary open to a random page and read all of the words, their definitions, and the etymology. I was fascinated about why each word was chosen to represent what it did, why some words had so many different meanings, and just the sound of different words. I used to enjoy the challenge of trying to deploy more obscure or at least unusual words into conversations. In doing so, I increased my vocabulary. Years later, as a High School English teacher, I used to encourage my students to do the same thing when they had idle time. I have never lost my love for words and my enjoyment of the richness of the English language with all its mongrel origins. Therefore, I knew I was in a tricky spot when this week’s Art Journal Adventure prompt was to incorporate a word and its definition in an art journal page. Impossible! How on earth could I ever choose a single, solitary word? By the time I actually had some free time for art, I had arrived at my solution: I was not going to visually represent one word; I was going to visually represent my love of all words. 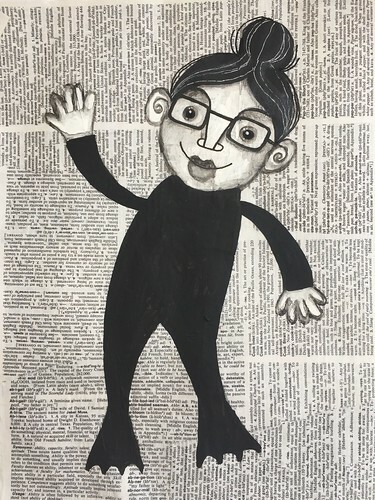 I, therefore, covered an art journal page in dictionary pages (from a discarded, library reject dictionary, worry ye not) and then drew my doodle version of me swimming among the words, an endless sea of vocabulary for me to explore, float through and enjoy. This past week was shaping up to be another in which I did absolutely zero art. I keep waiting for a week where my schedule is more flexible but in vain. I used to stay up late working on art but I have been too exhausted for that malarkey these past few months. I need to figure something out. Solutions on a postcard, please. Happily, however, on Sunday I met up with some local art friends and had a couple of hours in a coffee shop to work on my art journals. I had an idea of what I wanted to work on. However, I left the house in such a whirlwind that I left most of my travel art supplies sitting at home on my art table. I, therefore, had to come up with an idea of something I could work on with very limited supplies. Last week’s Art Journal Adventure prompt was something along the lines of the number 3. 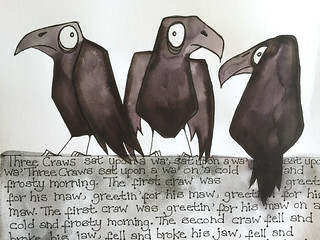 Not too long ago, I had a blog comment exchange with Claudia McGill about the Scottish children’s song “Three Craws Sat Upon A Wa'” and I assume that having that so recently in my brain meant that I came up with the idea of writing out the lyrics of the song and illustrating it with three crows. Despite being complimented all the time about my handwriting, my typography remains reliably awful. I decided to write in a childlike print for this page, given it was the lyrics of a childhood song, which should have theoretically made it easier to set out the placement of the words on the page. Regardless of the theory, in practice my writing went on all over the place with drifting away from the margin and that final word becoming isolated on the bottom line because of my inability to compose the text on the page. I guess writing in art journals remains a challenge for me. I am happier with the crow illustrations. Sure, they look a bit derpy and goofy but I like them. 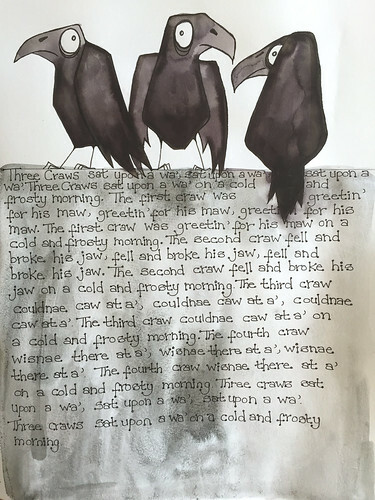 Having drawn the crows with waterproof micron pens, I used an aquapen brush marker to outline the shapes and then grabbed a water brush to spread the pigment out. I have seen people obtain beautiful results with water activated brush markers but clearly I am not there yet with my level of experience with them. I think the scrappy quality works well for depicting scruffy crows, however. Let’s go with that. Have I mentioned (more than a zillion times?) that I am over Winter and yearning for Spring? A couple of weeks ago, I saw a rabbit bound across my yard and I thought that was a sure sign. Turns out that bunny was just a dimwit who needed to stay in his burrow a bit longer. I also noted that our daffodils were sprouting out of the dirt. That was another hopeful sign. Then the shoots got buried under a foot of snow. Spring has to be soon though. It has to. 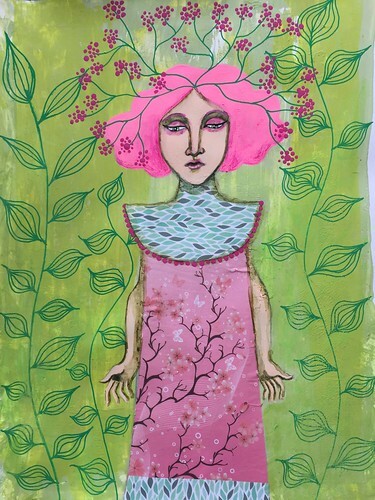 My latest art journal page was, therefore, inspired by thoughts of Spring. The Art Journal Adventure prompt was S which fitted perfectly with my intention of creating a Spring themed art journal page. The idea is a personification of Spring waking from a slumber and starting to bloom. I must confess that this was a far better idea in my head than translated on the page. I had to work in a whole load of small rations of time which certainly did not help in terms of cohesion and the fact that I rushed through some of the elements is very visible. I like the idea, however, and might return to it when I have more time to accomplish a better execution. I will state that my art work is perfectly straight – it is my iphone photography that is squint. On Friday, I went to work wearing a raincoat and carrying an umbrella since a rainstorm was forecast for the weekend. However, while I was at work, snow started to fall. I left work in a blizzard. Thankfully my kids were already on an early dismissal (I cannot remember the last time they were in school for an entire five day week) so two were already home and two I picked up on my way home from work. Just as we walked through the door, hoping to get cosy, looking forward to a steaming cup of tea, the power cut out. And it stayed out. From 2pm on Friday until 1am on Sunday, we had no power whatsoever. No light and no heat is pretty miserable in Winter. We kept ourselves occupied with board games and reading by candlelight. However, my 21st Century kids started to miss screens and WiFi after a mere 12 hours and things were rapidly descending into ‘Lord of the Flies’ territory. Thankfully the power came back on before they started sharpening sticks. Since I could not do laundry, cook complex meals, or run the vacuum around, I found an unexpected ration of time to spend on art. Sure, I could have dusted but you know how I like to sacrifice dusting so I can get in some art time. I decided to work on last week’s Art Journal Adventure prompt which was simply the letter W with an additional option to use shiny, shimmery or sparkly media. Perhaps it was because I had just illustrated a vampire on the previous page of my journal, but I was in a monster mood. That said, when am I never in a monster mood? 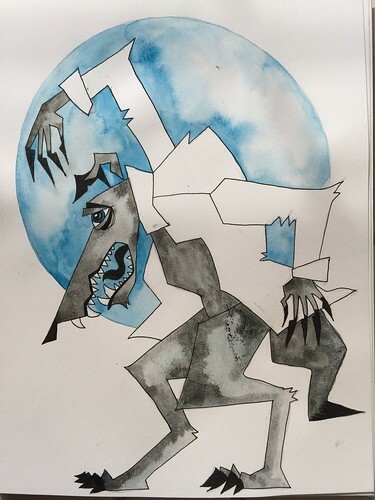 For me, therefore, W was for Werewolf and I set about drawing one in ink as the sun slipped towards the horizon and the house became gloomy in the dwindling light. It seemed apt for the subject but drawing in the dark is hard on the eyes. I added the diluted ink and watercolour by candlelight while my fingers shook in the cold. Amazingly, despite the circumstances, the illustration turned out to be completely acceptable. I hope, however, to not be doing too much future art in the cold and dark. I am SO done with Winter! I am a movie enthusiast and that has been passed on to a couple of my kids. The Academy Awards, therefore, are a big deal event in our house. I know that some people throw Oscars parties and they get dressed up all glam and drink elegant cocktails while nibbling on pretty canapes. However, in our house, we get all comfy in our jammies, I make nachos, and we play Oscars Bingo while watching the ceremony. Last year I initiated another tradition which was to draw the nominees from the four acting categories. 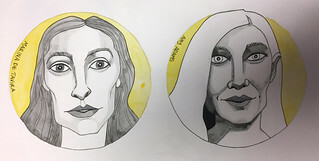 The results were very mixed and the likenesses were …. questionable but I had a lot of fun drawing them over the course of a few evenings so I decided I would do the same this year. Last year, I attempted a sort of semi-blind-contour, mug shot approach. 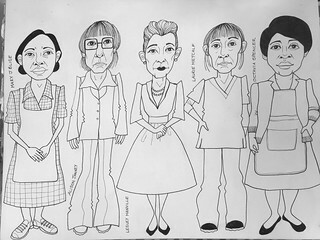 This year I decided to draw full length figures and to draw each actor in the role for which they were nominated. Again the results were mixed. 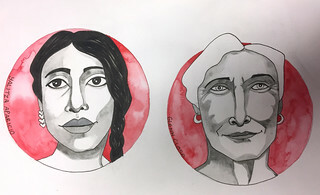 I think it is fair to say that I have made zero progress in the field of portraiture since this time last year but it is also the fact that I have not tried to develop or hone my skills in this regard. I don’t think anyone is going to sue me because the way I have drawn their face makes it look as if they melted on a hot radiator. My kids had a fun idea. What if my illustrations were prophetic, like studying the innards of geese and sheep, and could predict who would win in each category? What if the best (or least worst) drawing on each page was auguring the winner? First up are the best actress nominees. I have not seen a single one of the movies for which they are nominated – though I am eager to see them all – but on the basis of my drawings, poor Margot Robbie stands no chance. That really is an awful drawing as it looks absolutely nothing like her to the point of being insulting. My kids unanimously agreed that the best of the bunch is Sally Hawkins so let’s see if the prediction proves true on Sunday night. Next up are the best actor nominees. This page was when I realised the flaw in my plan of drawing each actor in the role for which they were nominated because I had to draw latex Churchill instead of Gary Oldman. I think Timothee Chalamet and Daniel Kaluuya are the best drawings on the page so, according to the prophecy, one of them ought to win. I shall plump for the latter since I have actually seen ‘Get Out’. I think that and ‘Coco’ might be the only nominated movies I have seen this year. Of the best supporting actress nominees, the only one whose nominated performance I have seen is Mary J Blige and I actually didn’t much enjoy the movie, though she was pretty good. 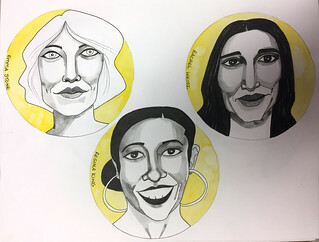 All of the women in this category had interesting faces that I enjoyed drawing. I think Alison Janney is the best drawing so let’s see if she takes home the golden baldie. 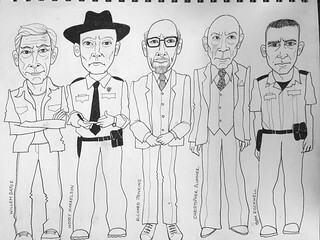 Lastly, the best supporting actors, looking a bit like a police station line-up since they all look a bit shifty the way I have drawn them. 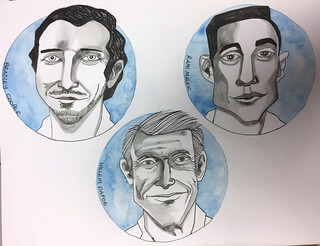 The likenesses are terrible but the best illustrations are probably those of Richard Jenkins or Christopher Plummer.